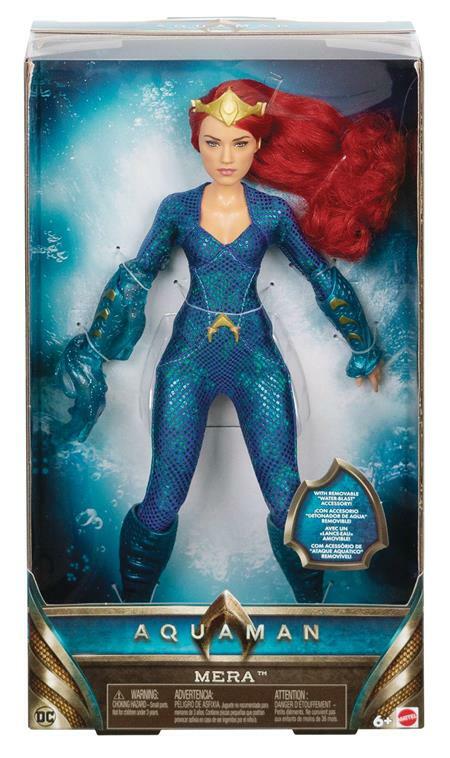 Defend Atlantis and reign supreme with this striking, true-to movie 12-inch scale Mera fashion doll! The stunning princess was created with state of the art techniques for lead actress and character authenticity. She wears a shimmering, soft goods, aqua scaled battle suit, has waist-length fiery red rooted hair, and an array of signature accessories. Her jumpsuit and accessories are fully removable for fashion play and include elbow-length gauntlets, sea foam knee boots, waist logo, tiara and iconic water blast super power! Enjoy exciting movie play, or pose Mera in a captivating display.